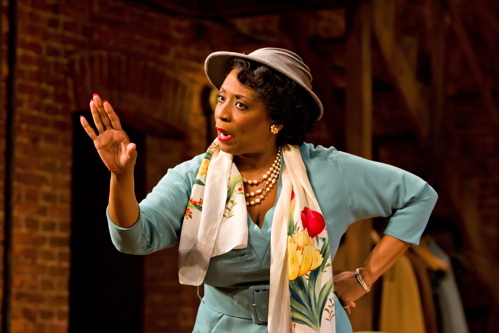 E. Faye Butler as Wiletta Mayer in the Arena Stage at the Mead Center for American Theater production of Trouble in Mind. Photo by Richard Anderson. If there’s a theme emerging from this year’s theater offerings it’s definitely the play-within-a-play. From Venus in Fur to The Habit of Art, many recent productions have highlighted the rehearsal process itself to uncover uncomfortable truths about power and control. These are all relatively new plays riffing on an old theme, but Trouble in Mind, the 1955 play now on stage at Arena, seems just as fresh. Written by Alice Childress to blow the proverbial lid off racism in the theater of her time, it’s eeriely (and sadly) still relevant. I wasn’t expecting the play to seem so current, but its sharp eye exposes not only racism but sexism and ageism as well. You wouldn’t think a social drama could be a comedy either, but this one’s wit can be deadly and hilarious. Reading the story of Childress’s struggle with Broadway producers over rewrites is infuriating enough. Watching her character Wiletta Mayer (E. Faye Butler) suffer the patronizing forehead kisses of her director and detail the indignities of having to be grateful to play Mammy roles just drives the discomfort home. Butler’s performance is the touchstone of this production – the war between Wiletta’s ambition to be an acclaimed actress and the betrayal of her integrity carries a constant electric charge. That Arena, one of the first theaters to integrate black and white actors, is staging a play about an integrated cast, just adds to the frisson. But the weight of history, especially in the District, doesn’t make this a museum piece. 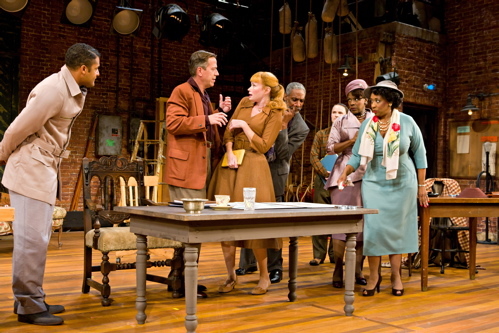 The cast of the Arena Stage at the Mead Center for American Theater production of Trouble in Mind. Photo by Richard Anderson. David Korins’ set lovingly recreates the brickwall backstage of a Broadway theater, right down to the fire safety curtain. An elaborate pre-show ritual with a disgruntled stage hand (T. Anthony Quinn) setting rehearsal tables together, only to have frenetic stage manager Eddie Fenton (Garrett Neergaard) pull them apart, sets the immediate tension. There are all sorts of levels to the structured battle of wills always inherent in a rehearsal. As the actors enter one by one, alliances are formed and broken rapidly. The neophytes, black actor John Nevins (Brandon J. Dirden) and white actress Judy Sears (Gretchen Hall), have an immediate connection due to age and sensibility but are quickly warned apart by their older compatriots. Their journey from nervous newbies to seasoned "luvvies" is clearly defined by director Irene Lewis, raising the audience’s sympathies to hope for their success in a future that doesn’t confine them to racial and sexual stereotypes. The veterans are led by Wiletta, her counterpart and sometimes rival Millie Davis (Starla Benford), and Sheldon Forrester (Thomas Jefferson Byrd), all well-used to playing caricatures and putting on broad smiles for their white director. Al Manners (Marty Lodge) is that typical infuriating mix of self-important charm and arrogance, though he seems to actually care about directing the play in a more exciting way – nods to the Method – he’s still the type to bully young Judy and condescend to Wiletta. As the rehearsal unravels, it’s increasingly clear that the play-within-a-play is just a masquerade. It’s supposed to be an anti-lynching diatribe, but its ethical holes are apparent. As the racism of the plot is revealed, Wiletta finds her principles compromised. The battle between director and actor begins. Part of the joy of this production is that despite the heavy themes explored, it’s funny – truly funny, and the humor drives the points home effectively. Lewis’s direction is so sharp and clean there’s no question this is a satire, and the actors dig in deep to both the comedy and the tragedy with brilliant results. The heart of the play is a riveting monologue about a lynching that exposes evil for what it truly is – simple and inexorable. Here the playwright’s voice comes through powerfully, as Childress shows us what kind of speech should really be in the play-within-a-play, and the moral failing inherent in its absence. The acting here is just exquisite, from Butler and Lodge’s battle royale to Benford’s wry skewering of stereotype. Richly rewarding as well is the delicate duets between Butler and Laurence O’Dwyer as Henry, the Irish doorman who’s seen it all and been abused by all in the process. His childlike wonder still at the beauty of the theater and his doting appreciation of Wiletta as an actor, devoid of any racial or sexual or ageist overtones, is clearly the playwright’s vision of how things should be between people. Bluntly: I can’t recommend Trouble in Mind enough. Arena Stage at the Mead Center for American Theater‘s production of Trouble in Mind now through October 23 in the Kreeger Theater. Located at 1101 Sixth Street NW, Washington DC 20024. Closest Metro stop: Waterfront (Green line). For more information call 202-488-3300.